Can David Cameron Close the Deal? With the Labour Government exhausted and its supporters dismayed, why isn’t the Conservative Party leader David Cameron sailing home to victory? Under the leadership of Prime Minister Gordon Brown, all the weaknesses of the Labour Party have been painfully exposed. British Prime Ministers are elected by the House of Commons, and the Members of that Parliament by the people; so when Brown’s predecessor Tony Blair resigned, his replacement as Labour Party leader became Prime Minister without a general election. In the country, Brown had been a popular figure – if only because he seemed to be the more trustworthy next to the mercurial Blair. But once he took office, Brown’s weaknesses were on view. Just as much as Blair, Brown was the architect of the ‘New Labour’ project that shed the party’s welfare state socialist image for a ‘Third Way’. Modelled on Bill Clinton’s revamp of the Democratic Party, the programme demanded that Labour stop using government to provide for its urban poor and trade union constituencies – supporters who would frighten away more aspiring middle class voters. But clearing the old-school socialists out of Labour’s policy-making bodies left an ideological vacuum that was filled by environmentalists, the culturati and NGO-enthusiasts for action over the third world. New Labour had freed itself of its traditional socialism only to become beholden to the enthusiasms of the educated political classes. Attention-grabbing ‘humanitarian interventions’ into third world countries were avowedly not in Britain’s national interests, but in pursuit of an ethical foreign policy. Money was directed into subsidising arts centres and other cultural projects. Government took on policies that protected the environment, but damaged industry: ‘traffic-calming’ measures – bus and cycle lanes, speed restrictions, congestion charge zones – were put in place with the express purpose of dissuading people from using the roads. Meanwhile road building was put on hold; licenses for new power stations were withheld, so that the country is facing blackouts in six years’ time; bans were put in place on use of GM crops. Labour did listen to the City of London’s financial lobby – Goldman Sachs’ Gavyn Davies was a close advisor, as was ‘Shrieky’ Shriti Vadera of UBS Warburg. Labour kept the Conservatives’ banking deregulation but retained Britain’s extraordinary legal controls on land development, so that credit to buy homes was readily available, but very few were built. Anyone sentient could have predicted the result: prices went sky-high putting home ownership beyond the reach of working class people. Given his subservience to the City, it was not surprising that when British banks over-extended position led to collapse in late 2008, Brown bailed them pushing public debt into the trillions. Labour’s traditional working class supporters were asking why their party was subsidising million pound bailouts to banks, while their own jobs were disappearing. Most Britons are proud of their armed services, but they had to ask why they were losing their lives in Afghanistan and Iraq. And they wondered how it was that the income gap between rich and poor was getting so much worse under Labour. Public disaffection with the political class reached fever pitch when newspapers published details of the Members of Parliament’s own expense claims. MPs were seen to have lied about their addresses to get the taxpayer to pay the mortgage, just as they put their relatives down as researchers and assistants. David Cameron ought to have been in the best possible place to take advantage of the government’s difficulties. But Cameron has proven for too much in the same mould as Gordon Brown, and Tony Blair. 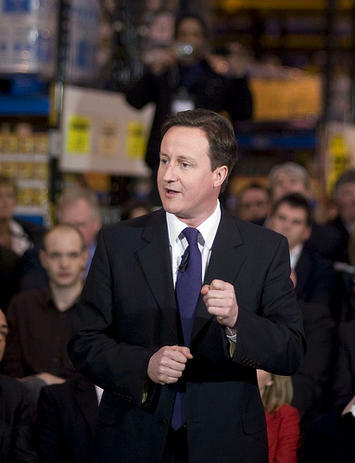 Cameron got to be Tory Party leader after three successive general election defeats. The lesson that the party drew from its experiences in 1997, 2001 and 2005 was that it was the Tory Party’s core brand that was at fault. Cameron was chosen largely by saying that the party should imitate Blair’s ideology-lite, environmentally-conscious, caring, dash for the ‘middle ground’. The Conservatives had to get over their ‘nasty party’ image. Cameron dropped a lot of the party’s traditional MPs, and invited people who were not mainstream Tories on board. Cameron’s remodelling of the Conservative Party followed the Brown-Blair model of pushing the core constituency aside to let in new faces. But the new faces that rushed in had the same gentry-liberal preoccupations as those that had taken over the Labour Party in 1997. Here’s an example of the new Conservative. As well as running an organic hobby farm, Zac Goldsmith is Cameron’s dashing prospective Tory Party candidate for Richmond Upon Thames. For the last ten years he has been proprietor and editor of The Ecologist magazine, Britain’s foremost green media voice. Zac inherited £300 million from his father, asset-stripping financier Sir James Goldsmith, using the proceeds to finance his pet causes through his own grant-making bodies, the JMG Foundation and the Isvara Foundation. He gives money to his own small-farmers groups FARM, which is committed to stopping private housing developments, has underwritten the Ecologist’s debts of £864,675. He has financed his own web-site SpinWatch to ‘expose’ corporate lobbying – though as Private Eye pointed out, its attack on the nuclear industry was curiously selective, mentioning no Tories, only Labour-backing investors (26 May 2006). Well-heeled voters in Richmond might not be too bothered that Zac has written a book The Constant Economy saying we need an end to growth, because they are already enjoying theirs. Another key Cameron supporter is advisor Philip Blond whose manifesto Red Tory bemoans the loss of England’s traditional charm under the twin evils of state socialism and the free market ideologies he blames upon the (conveniently foreign-sounding) Milton Friedman. Blond’s traditionalist fantasy of Merrie England is drawn from the backward-looking dreams of G.K. Chesterton and Hilaire Belloc, who railed against modernity back in the early twentieth century. Blond’s call for people to rely less on the state is well-made, but his anti-capitalism must have alarmed the party’s core supporters: ‘economic liberalism has often been a cover for monopoly capitalism and is therefore just as socially damaging as left-wing statism.’ Blond’s solution, though, is some state-enforced localism, with legal controls to redirect investment into municipal authorities – what he calls a ‘distributist state’. If this is David Cameron’s big idea, redistributing wealth through local government, it is not surprising that he has not made a great deal of headway in the polls given that everyone understands the real issue is the penurious state of the country’s finances. Throughout the election, Cameron has led in the opinion polls, but not by enough to guarantee a majority in parliament. When the country held its first ever televised leaders debate, something that the Tory leader had demanded, he was up-staged by Nick Clegg, leader of Britain’s third party, the Liberal Democrats. In truth Clegg’s appeal is not programmatic – he is pretty much more of the same as the other two. But what he did very effectively was to position himself as the outsider, not a part of the old two party system, a kind of younger, more attractive Ross Perot. Clegg’s appeal to the politically disaffected ought to have worked for David Cameron. But Cameron’s failing lies in the fact that he simply has replicated the New Labour project, just as the public were falling out of love with it. Environmentalism, stopping urban sprawl, and ‘restoring communities’ are the preoccupations of a narrow strand of British society: the kind of people who occupy the lower rungs of government service. It is not that most Britons want to trash the environment, or concrete over the countryide, nor indeed support community breakdown. It is just that they do not understand why their own self-betterment always has to give way to those concerns. Tragically, the only party that has made an issue of Britain’s chronic housing shortage is the far-right British National Party. Neither the Tories, nor Labour, less still the Liberal Democrats, have the courage to face down the NIMBY opponents of new building. The Tories’ own supporters (like the Lib Dems) have made it to the suburbs and do not want to share or expand them. Labour cannot give up its grip on government planning laws. With no-one willing to free up land for development, the BNP’s call to drive immigrants out is the loathsome conclusion of anti-growth sentiment. When they look at the Eton-educated front bench team that Cameron is putting up, voters see the kind of people who have made (or inherited) their stash, and now are pulling up a drawbridge behind them. All of the pious talk about looking after the poor sounds like parish charity, not giving people a chance to help themselves. David Cameron’s Conservatives are still the favourite to win the General Election, the only puzzle is why are they finding it so hard to close the deal – a puzzle until you look at their policies, that is. Submitted by Ian Abley on Fri, 04/30/2010 - 02:03. At audacity we've concentrated for a decade on the retreat of Britain's politicians from housing production, their love affair with house price inflation, and their empty rhetoric about "decent" or "affordable" housing for all. The three televised leader debates have been essential viewing, but show the vacuity of the three main political parties. There are Conservatives for change, illiberal Liberals, and a generation of new-labourites most intent on propping up the banks. They are all peddling a myth of "fairness". All of them believe in foriegn military adventures. The BNP are a political irrelevance when Conservative, Liberal, and Labour supporters believe that immigrants should be restricted from coming to work in Britain's low wage economy. Home grown bigotry originates with Cameron, Clegg, and Brown. They all favour compulsion to force people to take low paid "make work" schemes, and are all about extending the retirement age in an attack on what remains of the pension system. All are greens in their anti-industrial outlook, and their willingness to see too many people when there is only a systemic lack of productive dynamic. If this election has taught me anything it is that we've got to raise our political game. We've identified a fault line in British society - the economy's reliance on the city's expanding stock of mortgage lending sustained by the planning restriction that prevents houses being built on cheap farmland. We have to better oppose this trinity of mainstream political parties who will kill foreigners, stop others moving to Britain, and force greater austerity on the majority at home. Submitted by Julien Meyrat on Thu, 04/29/2010 - 11:36. The reference to Zac Goldsmith is interesting, and it kind of surprises me that he somehow has aligned himself with the Tories. Still, it's useful to point out that some of the most influential environmentalists come from the wealthiest families. In one blog post (http://architectureandmorality.blogspot.com/2009/05/beware-of-aristocrat...), I was inspired by British journalist Brendan O'Neill's take-down of Britain's green aristocracy. It's consistent with an overall air of elitism in many Third Way governments such as their dedication to subsidizing 'art centres and other cultural projects', which catered well to the elite predilections of many of my fellow architects. Submitted by Chris Squire on Thu, 04/29/2010 - 09:46. Not exactly: Richmond Upon Thames is the name of a London borough, comprising 2 parliamentary constituencies,both held by the Liberal Democrats: Twickenham [‘St’ Vince Cable, who has a large majority which he will increase] and Richmond Park [Susan Kramer, whom Zac is attempting to unseat, whose majority is small but expected to go up this time].